It’s a chilly, damp day here in Northern WI. Perfect day for a bowl of Cheesy Risotto, complete with a sprinkling of garden fresh, snipped chives. Easy Cheesy Risotto is comfort food at its best. 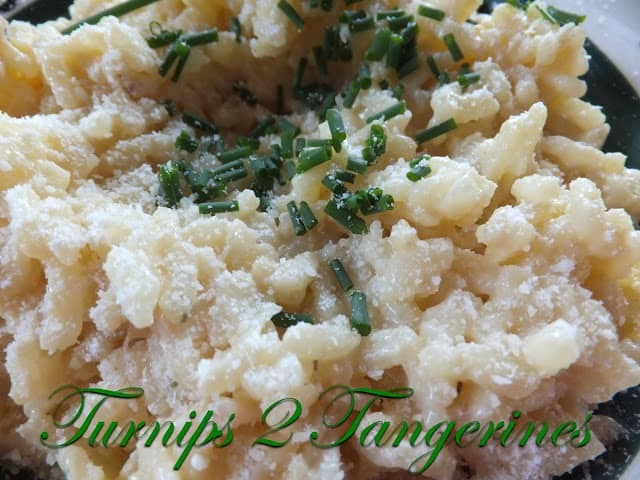 Serve risotto as a side dish or as a light lunch with a small side salad. Risotto [rih-Saw-toh; ree-ZAW-toh] An Italian rice specialty made by stirring hot stock into a mixture of rice and often other ingredients such as chopped onions, that have been sautéed in butter. The stock is added 1/2 cup at a time. The mixture is stirred continually while it cooks until all the liquid is absorbed before more stock is added. This labor-intensive technique results in rice that is delectably creamy while the grains remain separate and firm. Risottos can be flavored variously with ingredients such as chicken, shellfish, sausage, vegetables, cheese, white wine and herbs. Risotto Milanese is scented with saffron. The use of Italian arborio rice is the traditional rice used in the preparation of risotto. Arborio rice is a stubby, milky grain, once grown exclusively in Italy, is valued for its high starch content which results in the creaminess. Arborio rice, the classic choice for risotto, contains roughly 19 to 21 percent amylose. However, that is not the only difference. 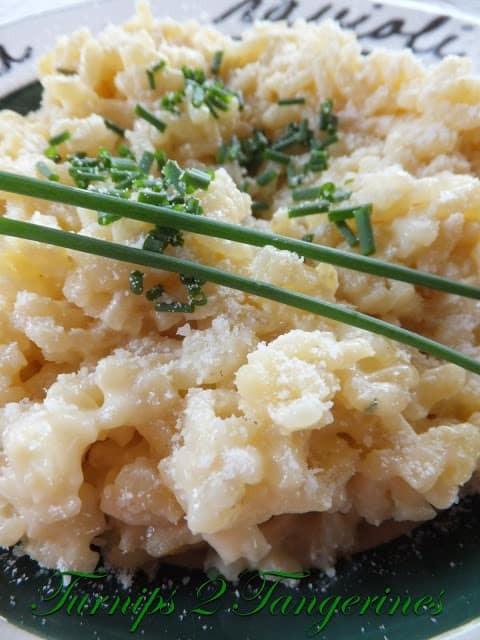 The desirable “bite” in risotto is due to a defect in Arborio rice called chalk. During maturation, the starch structures at the grain’s core deform, making for a firm, toothy center when cooked. That is the exact reason why arborio rice is used to make risotto that and because it tastes fantastic. 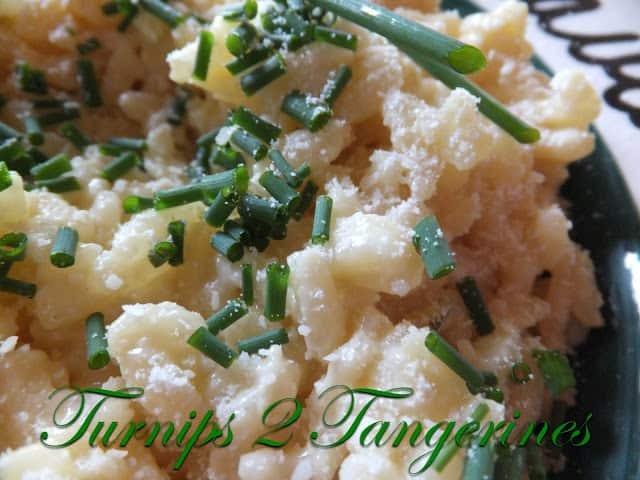 A terrific side dish or light lunch. In a medium saucepan, cook onion in hot butter until tender; add rice. Cook and stir for 2 minutes more. Carefully stir in water, bouillon granules, and pepper. Bring to boiling; reduce heat. Simmer, covered for 20 minutes. (do not lift cover) Remove saucepan from heat. Let stand, covered, for 5 minutes. Rice should be tender but slightly firm, and the mixture should be creamy. Stir in cheeses. Garnish with chopped chives. PBJ Banana Grilled Cheese Sandwich is a great sandwich both kids and adults will love. Whole Berry Cranberry Sauce is wonderful to serve alongside your holiday turkey. Thanks for all your support of Lets Get Social Sunday! !